I know you've all been there......"What? Oatmeal again?". I eat the stuff every morning! But I try to vary it. 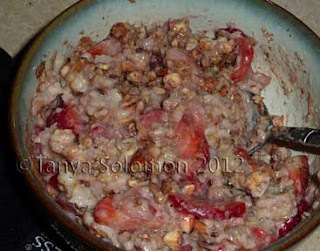 I usually switch between cooked whole oat groats in my rice cooker and steel cut oats in a pot. Occasionally I have soaked oat groats in the blender. The last several times I've eaten raw soaked buckwheat groats....I've not felt so hot after. Not sure why. But I'm keeping away from those for the time being. 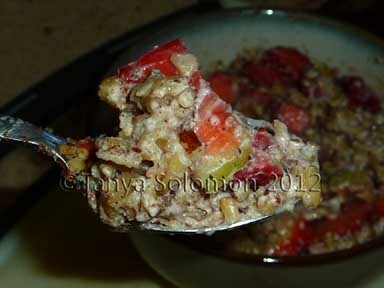 I make enough oatmeal for several days and then reheat them in the mornings. Anyway, recently I decided to figure out a way to sweeten my oats without adding tons of dried fruit and agave nectar. 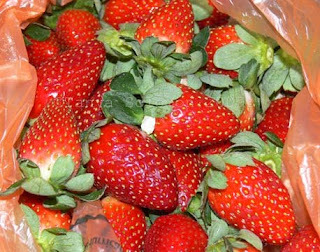 It's the beginning of strawberry season down here, so it's great timing. I've been picking up boxes of strawberries from the store for a great price! So here's my rendition of strawberries and "cream" oatmeal. If your oatmeal is already hot, add the strawberries and almond milk and microwave it on high for 30 seconds. Stir and add the nuts and cinnamon. If your oatmeal is cold, heat it in the microwave with the almond milk for about 1 minute on high. Then add the strawberries and heat for another 30 seconds. Stir and add the nuts and cinnamon. Done! It should be pretty creamy, but you're welcome to add more almond milk! (seen above with whole oat groats). How many different types of oatmeal do you eat? I adore oatmeal!! And this strawberry & cream variation reminds me of my childhood - so I will be definitely be trying out soon. Thanks for sharing!